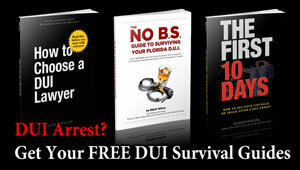 If you’ve been arrested for a Tampa DUI, you need to find the best Tampa DUI lawyer possible. You’ve probably been giving a lot of thought about which DUI lawyer you’ll choose to handle your case. Since drivers who hire a lawyer have much higher rate of success than drivers who don’t, it’s obviously a smart decision. Like everything in life, some DUI lawyers are better than others. But how do you know which one to pick? 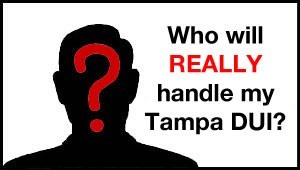 There are thousands of lawyers in Tampa, and hundreds of criminal defense lawyers. But of all those lawyers, only a handful have dedicated their practice to helping drivers accused of a Tampa DUI. That’s because DUI defense work (if you do it correctly) isn’t easy to do. And that’s why it’s important that you know how to spot an unqualified DUI lawyer so you don’t make the expensive mistake of hiring the wrong lawyer to help you. Experienced DUI lawyers call these types of lawyers “dump truck” lawyers, because they treat you and your DUI case the same way a dump truck treats garbage… They just carry you to court, and “dump” you out into a guilty plea as quickly as possible. Inside the courtroom, dump truck DUI lawyers are easy to spot because they just plead their clients guilty at an early stage in the proceedings, often before they’ve even received all of the information about the case. These lawyers don’t file many (or any) motions to suppress, they don’t go to trial, and they don’t fight all the way for their clients. 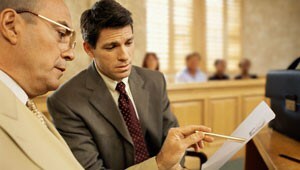 Unfortunately, if you spend any time in the courtroom, you’ll see a lot of Dump Truck lawyers handling DUI cases. But how do you spot the dump truck lawyer BEFORE you go to court and become a victim? There are a couple of clues that will help you spot a dump truck lawyer before you hire them. The easiest way to identify a lawyer who won’t very hard on your case is with the number of hours they’ll invest in your case. Defending a DUI case requires time. There’s no way around it. If a Tampa DUI lawyer is going to do a good job on your case, they’re going to have to invest time in your case. Obviously, a good DUI lawyer can cut down on some of the time required to handle your DUI case because they’re already familiar with the issues in DUI cases and won’t need to reinvent the wheel researching issues like breath testing defenses, the problems with the field sobriety tests, or caselaw research on the legality of your stop. But they still need to invest time in your case. All of these things require time. And the easiest way to determine how much time the DUI lawyer will invest in your case is with their fees. That’s because they won’t invest a lot of time in your case. You’ll get churned and burned quickly. For a thousand dollars or so, they’ll gladly walk you into court, hold your hand, and plead you guilty. But a DUI professional won’t do that. A qualified DUI attorney will charge a higher fee because they’re going to invest more time in your case. They’re going to prepare motions to suppress and fight your case for months (sometimes years!) before it’s over. And often, that’s why these DUI professionals get better results, because they’re willing to continue fighting long after the prosecution is sick and tired of the case. Dump truck lawyers won’t do that. If they drag your case out too long, they’ll invest too much time in your case, and they’ll end up making less than minimum wage. They won’t do that – so they’ll convince you to plead guilty, rather than fight your case. If you were afraid that you had cancer, would you trust the doctor who diagnosed you after just a few minutes on the phone? You’d want him to interview you for a long time, to conduct tests, to re-run those tests, and to spend as much time as required before he made any type of diagnosis. 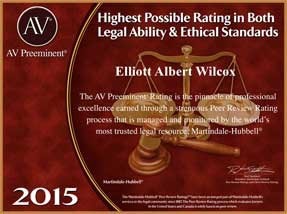 So why should you trust an attorney who quotes a fee after only a few minutes on the phone? There are hundreds of variables that can affect the strength of your case. There is no “one size fits all” solution to a DUI. That’s why an experienced DUI lawyer will want to meet in person—or at least conduct a lengthy phone consultation—before giving you an estimate. 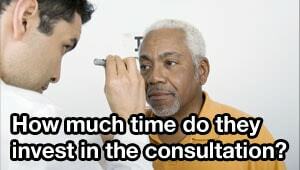 In fact, you should expect your initial consultation to last an hour or more. But a dump truck lawyer doesn’t need to spend that much time in their consultation. They know they’ll just be pleading you guilty, so they don’t have to worry about investing a ton of time in the diagnosis stage – they just say “Cancer!” and quote you a fee, even if what you really have is just the flu. Don’t trust them. Don’t trust a DUI lawyer who gives you a diagnosis without talking to you at length about the issues in your case. I rarely find the “Get Out of Jail FREE” card in a client’s case in the first 5 or 10 minutes of talking to them. Sometimes it happens, but it’s rare. Usually the key to their case is found very late in the conversation, often with what the client thinks is a trivial fact about their case. DUI professionals find those types of case-winning solutions because we invest the time to learn everything we can about our clients’ cases, and kick over every rock we can find to uncover the solution to your case. 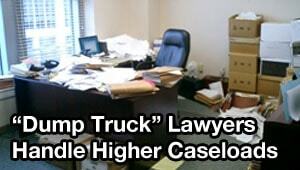 Another way to spot a dump truck lawyer is by reviewing their caseloads. The more cases they have, the less time they can spend on each one. They need to “churn and burn” your case so they can get to the next one. You don’t see the best heart surgeon in the country taking on hundreds or thousands of patients each year, do you? If a DUI lawyer has too many cases, they can’t invest as much time as they should in each client’s case. Proper DUI defense work requires preparation. A DUI lawyer can’t do that if they’re handling too many cases. The only solution they have to keep things under control is to get your case over as quickly as possible and get you to enter guilty plea. You could do that yourself… Why hire the lawyer? DUI professionals don’t do that. We handle smaller numbers of cases so we spend more time on each one. Why would they? It takes a lot of time to prepare for trial and to fight and win. If they’re not going to put the time into your case, the easiest way to do that is to avoid trial. Don’t just ask how many cases they’ve tried, but also ask how many cases they’ve gotten dropped on the morning of trial, too. It’s not unusual for an experienced DUI lawyer to get your case dropped on the morning of trial. For example, I had a string of 4 jury trials in a row where the prosecutors dropped the DUI case completely (called a “nolle prosse”) before we even picked the jury. Dump truck DUI lawyers can’t do that, because they won’t invest the time to be prepared and ready to attack the prosecution’s case. They won’t even let the case get close to a possible trial, because they’re afraid it might mean they’ll need to spend more time than they budgeted on the case. Instead, they’ll convince you to plead “guilty” at the pre-trial conference. Will the person you’re talking with be the person responsible for going to court and handling your case? Or will they farm it out to someone else… Maybe a junior associate, a flunkie, another law firm (this often happens when you find the lawyer through an internet ad, but the lawyer you’re talking with actually practices in another county on the other side of the state), or worst of all, someone hired on a “per-appearance” basis who gets paid $100 or so just to go to court and plead you out. When you hire a DUI professional, the lawyer you hire is the lawyer you get. (Translation: Everybody is responsible for your case, so no one is responsible for your case). You don’t deserve to have any of those imposters touch your case. When you hire a DUI lawyer, the person you speak with should be the person who handles your case every step of the way. “Dump truck” lawyers don’t make the investment in their ongoing DUI education. It’s not cheap to be a DUI professional. 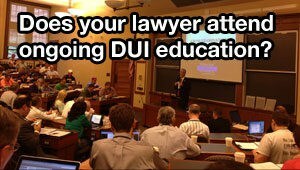 Here’s a quick idea of what’s required if a DUI attorney wants to stay on top their educational requirements each year. These aren’t just one-time expenses, either. DUI law is constantly changing. What worked yesterday won’t necessarily work tomorrow. Dump truck lawyers don’t make that type of investment in their education. Why would they? It doesn’t take a great deal of knowledge or experience to walk you up to the front of the courtroom and plead “guilty.” A monkey could do that. You deserve better than a monkey, don’t you? How can I say that it’s worse to hire a dump truck lawyer than to not hire anybody to help you? Easy. The money that you spend on a dump truck lawyer is wasted. If all they do is walk you into court and plead you guilty, they didn’t do anything to earn the money. 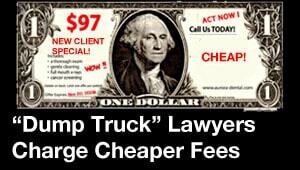 You’d be better off taking the money and spending it on court costs or DUI school rather than a dump truck lawyer. At least then, you’d get some value out of the money. Your only way out of a DUI is to fight it and WIN. DUI cases are serious. If you’re convicted, not only are you facing fines, license suspension, and a possible jail sentence — you’re also stuck dealing with the “hidden costs” of a DUI (FR-44 insurance), which can easily climb into the tens of thousands of dollars. 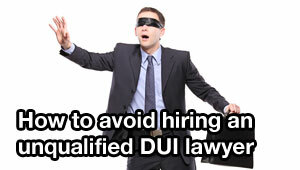 The worst investment you can make in your DUI case is hiring an unqualified “dump truck” lawyer. The best investment you can make is to hire a DUI professional. If you hire a DUI professional who can get your charges reduced, and you can avoid the FR-44 insurance requirements, you could easily save more than $25,000 by avoiding the increased insurance costs. When you hire a DUI professional, you’ll have a caring, dedicated attorney helping you every step of the way. Unlike a dump truck attorney, a DUI professional cares about you and the outcome of your case. DUI professionals take personal pride in their win/loss records and their track record of successful outcomes. If you or someone you care about has been arrested for DUI, you should NEVER hire a dump truck lawyer. 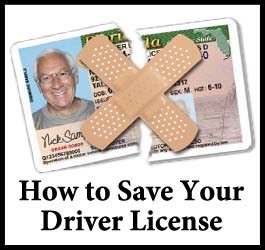 If you’re going to hire anyone, you should ALWAYS hire a DUI professional to handle your case. Hiring a trusted DUI professional to handle your case is affordable, and the quality representation you’ll receive will be worth every penny.